The building of a sukkah begins immediately after Yom Kippur. It is traditional to build and beautify the sukkah with a variety of pictures and decorations that reflect the themes of the festival. This is, after all, a temporary dwelling place where we invite friends and family, as well as spiritual guests (ushpizin) such as our ancient patriarchs and matriarchs. Over the years, Beth El has sold two different types of sukkah: one made from wood, and one made from pipes. Below, you can find instructions for both kits. 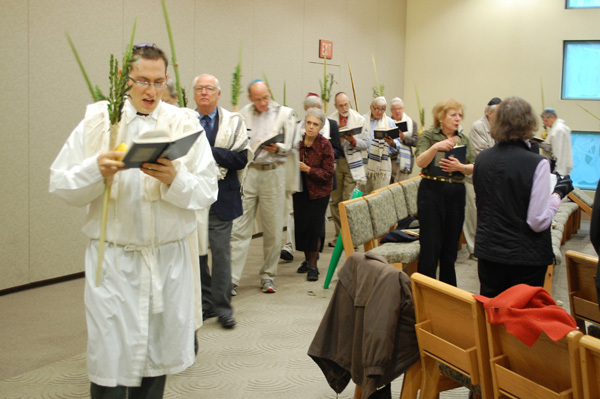 Sukkot, more than any other festival in the Jewish calendar, enjoys a series of diverse rituals and moods, and the music reflects this variety of festive and liturgical expression. The rich plethora of moods includes thanksgiving, aesthetic beautification, rejoicing, dancing, singing, hope, and judgment. The heart, the mind, and the body are all engaged in this pilgrim festival of Sukkot. Hoshana Rabbah, the concluding day of Sukkot, contains musical touches of Yom Kippur and Rosh Hashanah. The familiar majestic melody for the great Kaddish chanted before the Musaf on the High Holy Days, for example, is appropriated for the Kaddish prayer on Hoshana Rabbah. The melody reflects the fact that, according to Jewish mystical tradition, even as late as the end of Sukkot, there is still time for repentance. Also on Hoshana Rabbah an additional set of willows is beaten against the floor and walked for seven circuits around the perimeter of the synagogue to symbolize our determination to separate sin from our lives. The last day of the festival is called Shemini Atzeret, the “Eighth Day of Solemn Assembly.” The day marks the beginning of the rainy season in Israel and contains an element of God’s judgment regarding water, famine, and plenty. During Shemini Atzeret, we recite Tefillat Geshem, the prayer for rain, with a unique musical motif. This most important prayer pleads for an ample supply of rain. The concluding climactic day of the festival is Simchat Torah, the completion of the annual reading of the Torah and the immediate beginning, once again, of the reading of the first chapter of Genesis. We are all familiar with the bursts of joyous music and dancing associated with this celebration and the accompanying sense of abandon and exhilaration. This is a great opportunity to sing selections from the vast repertoire of Israeli, Yiddish, and liturgical songs. Dancing and singing with the Torah scrolls reminds us of the joy in Judaism and of the faith in a future of peace and redemption.